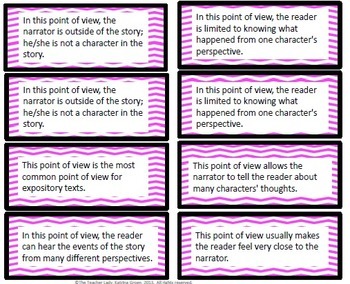 It's a fact: students struggle with Point of View. 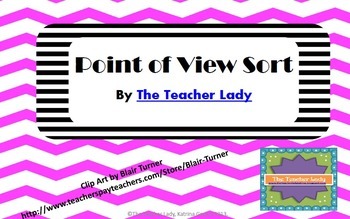 Make review and extension fun with this Point of View Sort! The document contains attributes and examples of 1st Person, 2nd Person, 3rd Person - Limited, 3rd Person - Omniscient, and 3rd Person Objective points of view. The examples come from authors such as Jack London, Dr. Martin Luther King, Jr., Willa Cather, Ernest Hemingway, Stephen Crane, and others. The attributes and examples should be cut out and placed into envelopes. 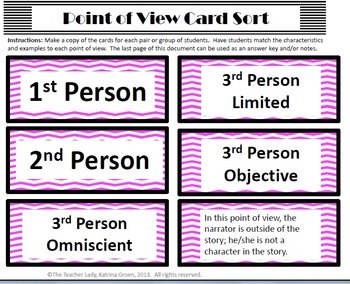 Then, in pairs or small groups, students will sort the attributes and examples by point of view, matching the points of view with the examples and attributes. Finally, using the included answer key, the teacher can go over the answers, asking students to justify how they knew each example/attribute went with each Point of View. 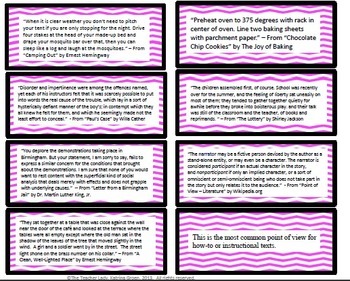 This is a great activity to help students learn by doing! Looking for other Elements of Literature Resources? Check out The Teacher Lady Store!